NEW YORK, NY–(Marketwired – Nov 11, 2014) – Add joy to your New York City travel itinerary by bringing your pet along and taking advantage of pet-friendly accommodations at the Renaissance New York Times Square Hotel. Pets are welcomed with special amenities and even a list of local pet-friendly attractions, at this stylish boutique hotel, that knows the importance of worry-free travel. Encouraging guests to share travel time with their pet brings added comfort that can only be provided by a furry ‘best friend.’ By eliminating the worry of leaving a pet at home, this is a great way to ensure an exceptional travel experience. The attentive staff of this pet-friendly hotel, who pamper pets with services during a stay in Times Square, is happy to provide a cozy pet bed, pet bowls and even a special treat, so pets can settle in and enjoy their retreat. The Renaissance New York Times Square Hotel has created a fun infographic to draw attention to the many pet-friendly things to do, in the city that never sleeps. The infographic features restaurants, specialty shops, festivals and events inspired by the millions of dogs and cats that help make life’s journey more enjoyable. An oasis of pet-friendly establishments, New York City is filled with parks, businesses and services that welcome pets to dine, play, be pampered and even shop. From bakeries, featuring gourmet dog biscuits and snack stands with special pet menus, to fun eateries such as Fetch Bar & Grill, famous for their original Philadelphia cheese steak — or the Barking Dog Luncheonette, which features convenient outdoor doggy watering fountains, bringing your dog to New York City is well-accepted. For a full day of fun, start early with a stroll in Central Park, where dogs can go unleashed before 9:00AM in many areas; or strike up a game of Frisbee at Socrates Sculpture Park. Athletic canines might enjoy a swim at Long Meadow Dog Beach or the rolling hills of Sir William’s Dog Run, the city’s largest enclosed area for dogs. After a frolic in the city, take your friend for a pampering “pawdicure” at Spot, full-service grooming at Le Pet Spa, or explore shops and boutiques filled with organic apparel, designer look-alike clothes, unique treats and pet care products. More information on events and locations that welcome pets to New York City can be found on the hotel’s infographic at http://travel.marriott.com/new-york-city/pet-travel-guide-infographic/. The Renaissance New York Times Square Hotel is conveniently located in the heart of New York City providing guests with luxurious, full-service accommodations, rising 26 stories above Times Square and just steps away from popular entertainment, attractions and business destinations. Boasting interiors crafted by famed designer Jordan Mozer, the hotel’s chic, redesigned guest rooms feature hardwood furniture, marble bathrooms, cotton-rich bedding ensembles and state-of-the-art technology so guests have everything they need to rest easy whether traveling for business or leisure. All guests enjoy the convenience of 24-hour room service and club level accommodations are available for added amenities. While grown-ups lined-up at the polls Tuesday, some Biloxi children also learned about the power of voting. Nativity Elementary School in Biloxi held its first election. It was a political battle that pitted popular pets against each other. “Dogs can rescue people,” one boy stated. “Dogs only have one life. Cats have nine,” his friend countered. The heated campaign pitted canines against felines. After two weeks of political debates and persuasive speeches, it was time for the students to pick their favorite pet. Nativity Elementary’s Cub Scout Pack 213 spear-headed the school-wide election. “In the future, if they’re voting, it’s a big decision and they can remember this and remember how to vote,” said fifth grader Landon Jenkins. The boys chose their own leaders, created posters, and presented their opinions during an assembly. Breton Guice dressed up as Honest Abe and led the crusade for cats. “I was going to be in this costume and hand out Kit Kats, saying ‘Vote for Cats! '” said Breton. Meanwhile, Landon Jenkins didn’t want to be the underdog in this race. So he used a different strategy. “I said dogs can understand over 250 words and I went, can a cat? No,” said Landon. He also got a little help from his younger brother Carson. “Who let the dogs out? Huh, huh, huh, huh,” sang Carson. “I voted for dogs, because I have a Pug and he’s really cute, but sometime he stinks,” said fifth grader Augie Tremmel. Second grader Gianna Morales cast her ballot for cats. “Because I got my cat on my birthday,” she said. The experience taught the young voters why their voice really matters. After a quick hand count, the principal announced the final tally. “The results are cats, 34, dogs, 120!” she shouted. The crowd in the cafeteria erupted in cheers. Cats may be purr-fect, but at Nativity, dogs rule. The teachers also got a chance to vote, and the goal is to hold a similar election every November. 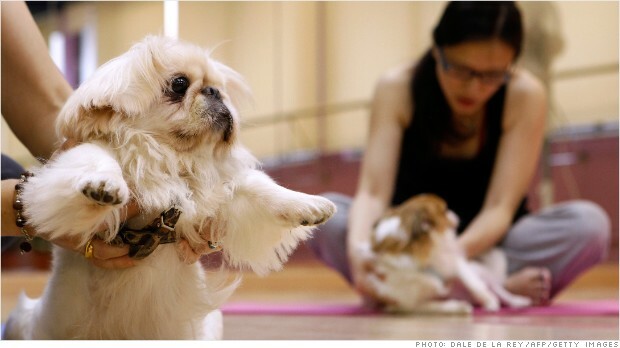 Rising disposable incomes in China are fueling an explosion in the pet care industry. 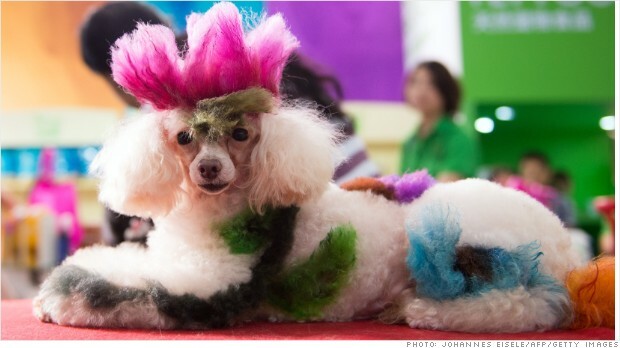 It’s the latest growth industry in China: pet lovers are spending billions pimping their pooches. China has one of the world’s lowest birth rates, and a growing number of middle class couples are choosing to lavish their time and money on pets rather than kids. Take Phoebe Yu and her husband. 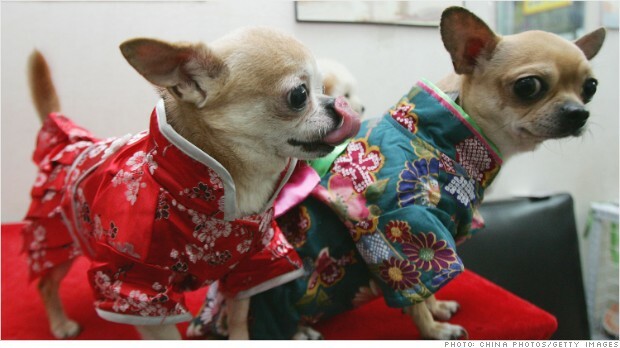 Their busy Shanghai household of four cats and two dogs costs about $600 a month in pet food, litter and baths. And then there are annual health checks at $245 per pet, soaks in Japanese hot springs and sweaters for winter. “I take my dogs and cats to the salon for beauty maintenance; in the summer, they relax in cooling baths, and sometimes get spa mud masks,” Yu said. She’s not alone. About 7% of households in China now have a dog, and 2% have a cat. Ownership rates are expected to rise rapidly, boosting the value of the pet care industry by 43% to 13.5 billion yuan ($2.2 billion) over the next five years, according to research firm Euromonitor. The growth is not just about quantity. Demand for gourmet products and luxury services is on the rise. Pet owners are trading up from table scraps and home-cooked food in favor of premium recipes. Companies such as Nestle (NSRGF), which owns the Purina brand, are introducing new offerings or moving production to China. 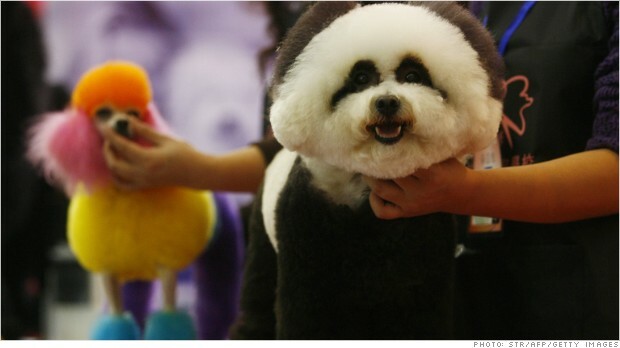 There’s also a growing array of specialty services: acupuncture, Chinese herbal remedies, fur dyes and perms to make puppies look like pandas, pretty manicures and dog yoga — also known as doga. One Hong Kong salon even offers Chinese-style massage and bone-setting techniques to prevent arthritis and relieve hip joint pain at $20 for 15 minutes. Financial services firms are cashing in, too. Just last month, state insurer PICC started offering pet insurance policies that cost as much as $550 a year, state media reported. Yu, who works part time, says she and her husband decided against having kids because they were worried about pollution, food safety, public order and academic pressure. She’s happy to spend on her furballs, and says having pets is much less work than raising children. Yu, 36, even asks friends traveling abroad to bring back the latest in pet haute couture — her favorites are Korean animal fashions. A blue tongue lizard is set to join an array of dogs and cats at Auckland’s pet expo this weekend. Organisers say hundreds of pet products and services will be exhibited at the 5th annual expo in Greenlane today and tomorrow. A recent survey found New Zealand is a nation of pet lovers, with almost half of those surveyed happy to take their pet on holiday when they travel domestically. Hotel booking website Wotif found dogs are by far New Zealand’s most travelled animal, accounting for 85% of pets taken on holiday, while cats account for 12% of travelling pets. Some pet owners even admitted to taking their bird, rabbit, reptile and fish on holiday. The survey also found 19% of those who travel with their pets have smuggled their furry friend into accommodation which wasn’t pet friendly. “Pet owners revealed going to great lengths when smuggling their pets into non pet friendly accommodation, with pets being hidden in beach towels and in backpacks and one pet owner admitting to feeling so guilty they snuck out at 2am,” says Wotif product director Donna Rodios. However, not all pet-toting travellers got away with it, with 10% admitting to getting caught out when staying in non-pet friendly accommodation. Bravo of Manchester, CT is recalling select lots of Bravo Turkey and Chicken pet foods for dogs and cats because they have the potential to be contaminated with Salmonella. Salmonella can affect animals eating the products and there is risk to humans from handling contaminated pet products, especially if they have not thoroughly washed their hands after having contact with the products or any surfaces exposed to these products. The recalled product should not be sold or fed to pets. Pet owners who have the affected product at home should dispose of this product in a safe manner (example, a securely covered trash receptacle). Customers who have purchased the recalled pet food can return to the store where purchased and submit the Product Recall Claim Form available on the Bravo website www.bravopetfoods.comdisclaimer icon for a full refund or store credit. More information on the Bravo recall can also be found at www.bravopetfoods.comdisclaimer icon, or call toll free (866) 922-9222 Monday through Friday 9:00 am to 5:00 pm (EST).